Interesting photo of Alexandra Park with the city centre in the background. This is before Beechen Cliff school was built. 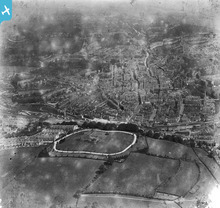 Looks as though the bowling green is present in this picture as it is now. A great image with some lovely fingerprints in Alexandra Park! Lived in Batheaston 1961-1971 and parents carried on living there with me visiting until 2006. Very interested in the buildings which have been demolished.